Summary: Ripeti Con Me is an Italian course that’s similar in style to Glossika but fixes many of the problems I have with it. It teaches the language intuitively and requires you to speak throughout the lessons. Not everyone will love the lesson style but it’ll definitely improve your speaking rhythm and understanding of Italian. The lesson materials are fairly basic but well-structured. Previously taught materials are reviewed frequently in new sentence patterns. The price is fair for what’s included in the lessons. The focus on Italian culture, names, and places. The manner in which things you’ve learned come up later on in future lessons. The lessons and recordings have better spacing than Glossika. It’s not a particularly exciting course. There are no game elements to keep you motivated. Not everyone will like the lesson style where key concepts aren’t explicitly taught. One great thing about having created this website is that I get to see and try out lots of new language learning products. More often than not, my favorites are those that don’t get a lot of exposure from other places. Maybe they’re created by a small team or just one person and are competing against massive companies with huge marketing teams. Recently, Stefano Lodola, and Italian teacher, translator, and polyglot reached out to me and asked if I’d consider trying out his new Italian course – Ripeti Con Me. His course is largely inspired by Glossika, a product that I’m very familiar with. Although I think Glossika is useful, there’s quite a bit that I dislike about it and a lot that could be improved upon. That’s what Stefano did with Ripeti Con Me. He made a better alternative to Glossika for Italian learners. The idea behind this course, as well as Glossika, is that you’ll improve your Italian by speaking lots of sentences. Sentences come up again at varying intervals. But you’re not simply parroting the sentences. As you go through the course, small changes are made to the sentences, moving different components in and out. In this way, you’re learning new words and how sentences are formed. Grammar isn’t explicitly taught but you’ll begin to pick up the various grammar points on your own. I tried out this course with zero knowledge of Italian and within a few days was able to figure out some different verb forms and gender usage. More importantly, I found myself able to say full sentences and be able to substitute in and out various pieces to express different meanings. Neither Glossika or Ripeti Con Me are the most flashy or exciting courses. There are no games, points, or any of that extra stuff. You’ll have to be self-motivated to really keep up with it. That said, it’s not difficult to do a bit each day. The course materials are quite basic and consist entirely of audio files and pdfs. Lessons last approximately 30 minutes and you’re meant to complete one lesson each day. Currently, there are 45 lessons for sale but new lessons have already been designed and will continue to be added. In each lesson, there are 30 sentences for you to learn. Each day, you’re meant to listen to 3 audio files that will get you thinking in Italian and speaking throughout. There are three parts – Part A, Part B, and Part C and you’re meant to go through them in that order. In Part A, you’ll hear Stefano first say a sentence in English. After that, he’ll say the sentence in Italian and you’re meant to just listen. Then, he’ll say the sentence one more time in Italian and you’re meant to shadow him – saying the same sentence while he’s still saying it. In Part B, you’ll hear Stefano say the sentence again in English. Then, there’s a pause where you’re meant to say the sentence yourself in Italian. It’s alright if you can’t remember everything, just do your best and say what you can. Then, he’ll say the sentence again in Italian and you’re meant to shadow it. 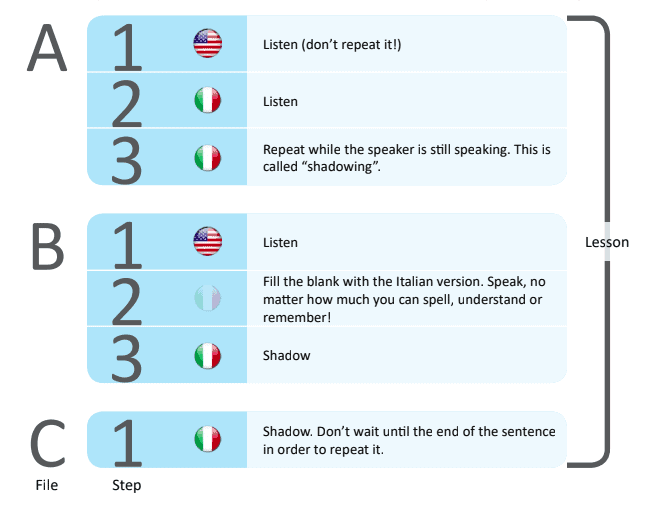 In Part C, Stefano will say each sentence once in Italian and you should shadow his speaking each time. You’ll notice that Stefano does have a bit of an Italian accent when speaking English but its not a problem. You can understand everything he says. There’s also a pdf file that comes with the course. 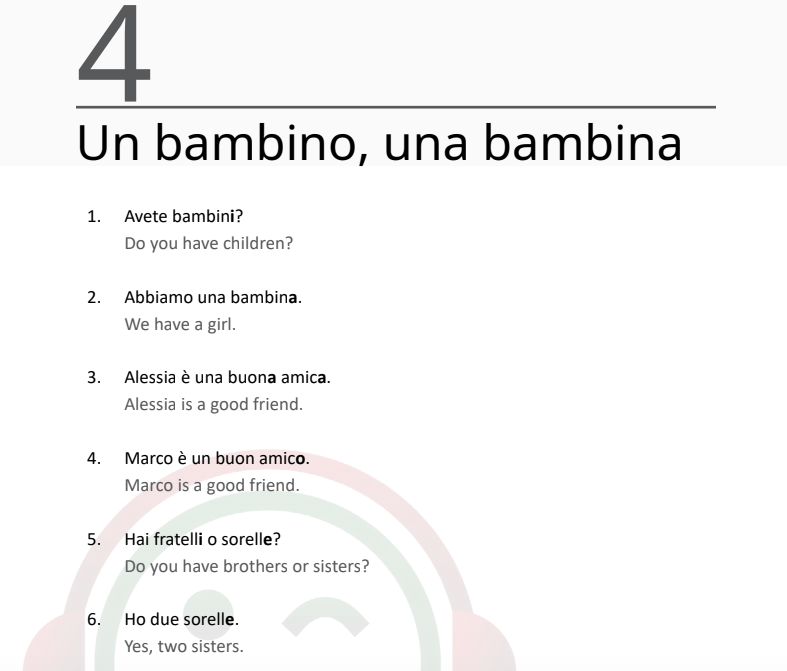 In the pdf, you’ll see each sentence written out in Italian and English. The grammar that is emphasized in the lessons is bolded. One thing that I really like about the lessons is how they progress. Initially, I struggled to keep up but I found that much of what I learned in one lesson was reviewed in a later lesson using a different sentence pattern. As I said before, Ripeti Con Me was inspired by Glossika. While it’s fairly similar, there are quite a few differences. Or rather, things that Glossika does poorly that Ripeti Con Me does much better. Glossika uses the same sentences for every language. They completely ignore the cultural differences. Ripeti Con Me is made specifically for Italian. The sentences use Italian names, places in Italy, and reference various unique aspects of Italian culture. Glossika’s audio recordings are really rushed. There is often not enough time to say the sentences. Some of the sentences are far too long and they progress through the sentences at a very fast pace. Ripeti Con Me is paced much more appropriately. The sentences aren’t unnecessarily long and the amount of time between recordings is more reasonable. You won’t feel as rushed to try to spit out a sentence, only to get cut off by the audio. Ripeti Con Me’s lessons also progress at a more natural pace. They build upon previous lessons much better and re-emphasize points throughout. Glossika isn’t suitable for beginners. You’d want to have at least reached an elementary level before using it. Ripeti Con Me starts at a lower level and focuses on essential vocabulary. The slower pace makes it much more accessible to new students. Although I think Ripeti Con Me solves many of the problems that Glossika has, there are still a few weaknesses. The second issue, which isn’t necessarily a problem, and is also shared with Glossika and most other resources, is that Ripeti Con Me probably shouldn’t be the only thing you use to study Italian. It’d be best to also use other resources along with it. As a complete beginner to Italian, I felt like I would benefit from a more concerted effort to learn proper pronunciation. While I felt like my pronunciation definitely improved from speaking a lot, I could tell that I was still making mistakes that would require more attention that’s beyond the scope of this course. Additionally, combining this course with resources like Anki or Memrise to help review words could be useful, though there’s enough repetition throughout the course that it may not be necessary. You may also want to listen to some Italian podcasts as a way to get more passive listening practice. If you’re learning Italian and considering using Glossika, I’d strongly recommend using Ripeti Con Me instead. It fixes many of the problems that make it hard to recommend Glossika. The slower progression of the courses, Italian focus, improved spacing with the audio files, and the manner in which the lessons build upon each other make it a much better course. 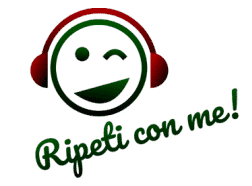 Ripeti Con Me can definitely help you improve your Italian, especially speaking. It’s very easy to avoid speaking while studying a language but this course forces you to start speaking Italian right away.